Bottlebrush Orchids are once again in flower at Wildwings. 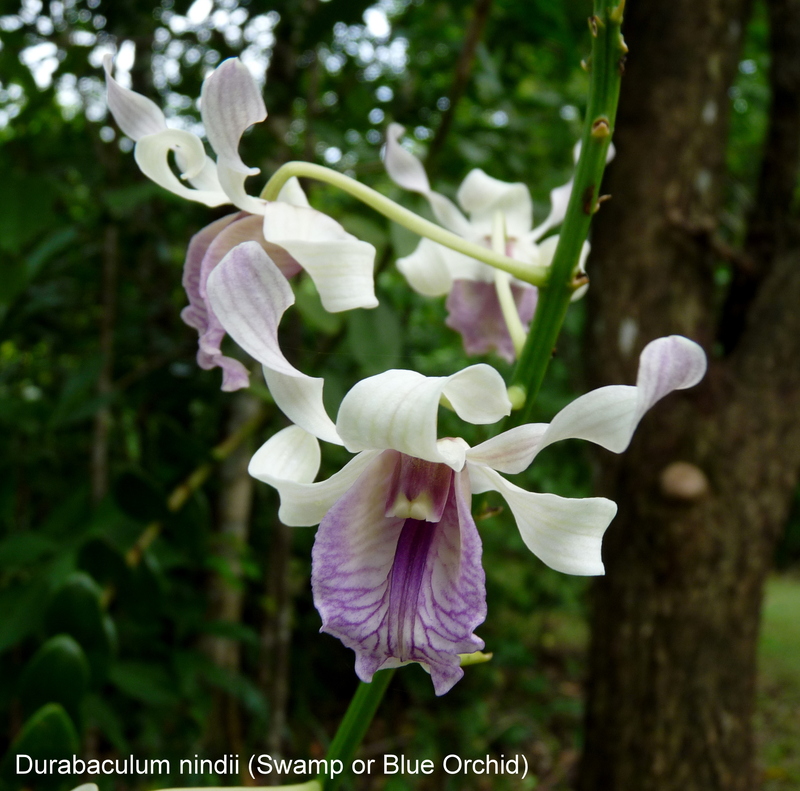 This unusual orchid, which was previously known as Dendrobium smillieae, prefers to grow on flaky barked trees such as Melaleucas and Leichhardts. In this case it is Melalueca leucadendra. The flowers form at the ends of long canes in a tight cluster. Sometimes, as in this case above, the spike will split into two heads making the “bottlebrush” a little strange. Flowers begin to open from the bottom of the cane towards the tip of the spike and last several weeks before collapsing. The flowers are a subtle blend of soft pink, white and green. Unlike some of the more flamboyant orchid flowers the petals of the Bottlebrush Orchid are fused together for much of their length and consequently are tube-like with a ruffle of fringed petals towards the ends. Geodorum literally means earth gift and terrestre = terrestrial. 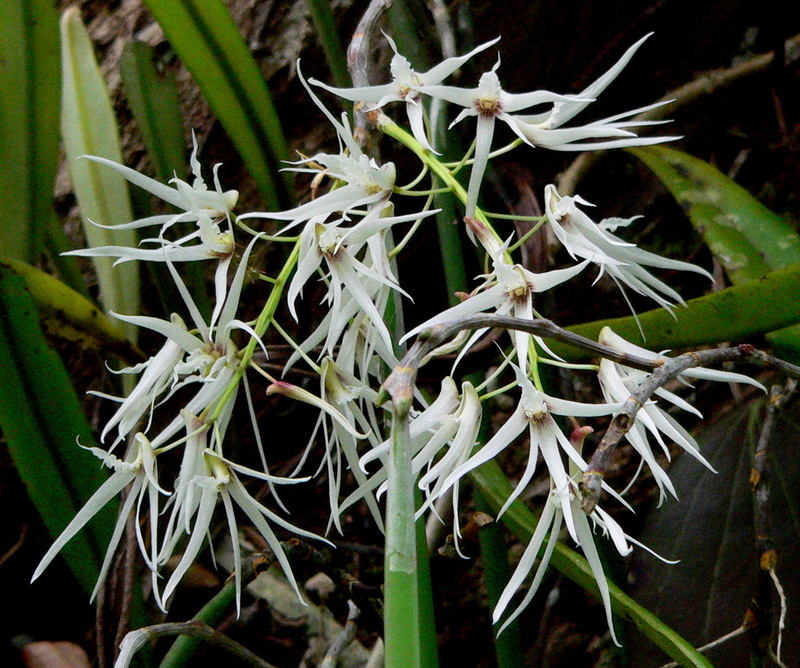 This very attractive ground orchid responds to the early rains of the wet season with rapid, active growth. 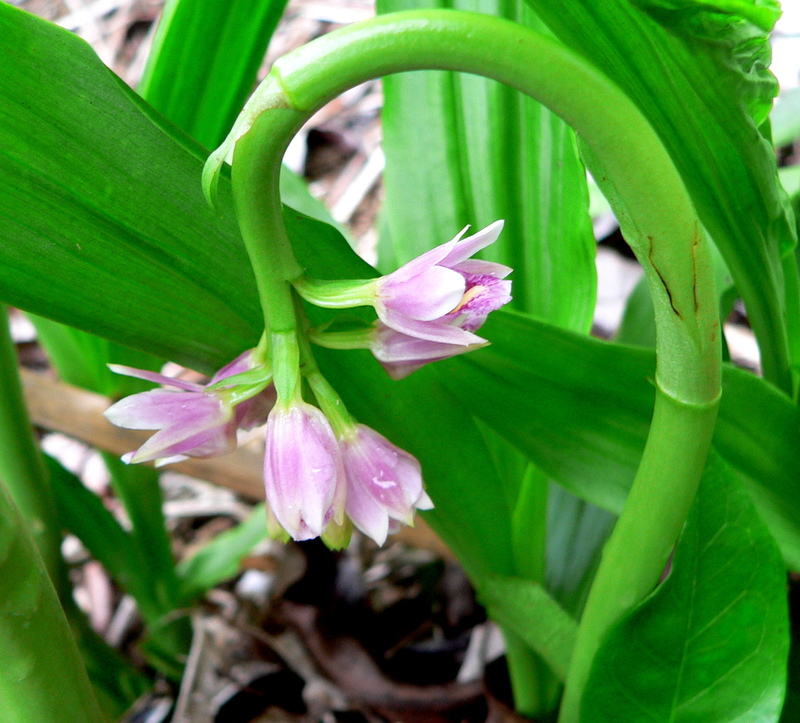 The plants grow with tightly packed fleshy pseudobulbs supporting yellowish green, heavily pleated leaves. 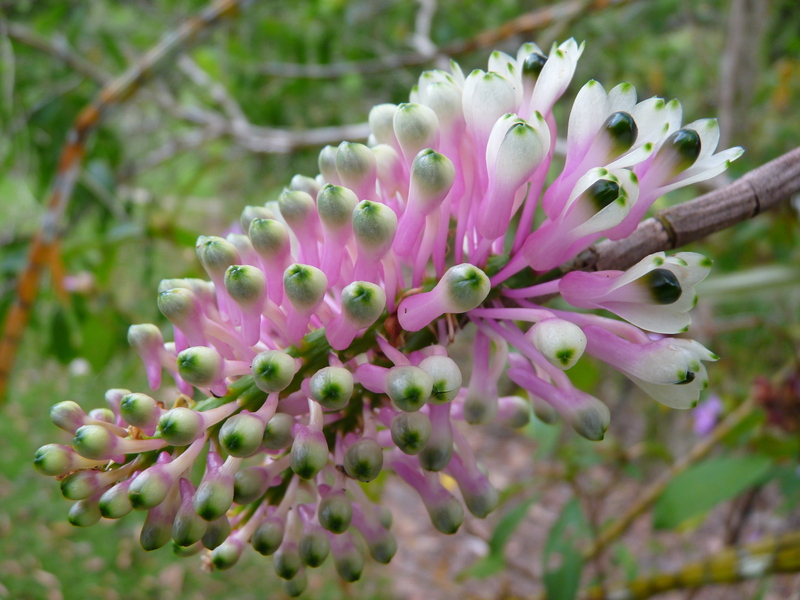 The soft pink flowers are presented on a arching stem that allows the flowers to hangs down, perhaps to help them avoid the impact of heavy rainfall on the fertile parts of the flower. 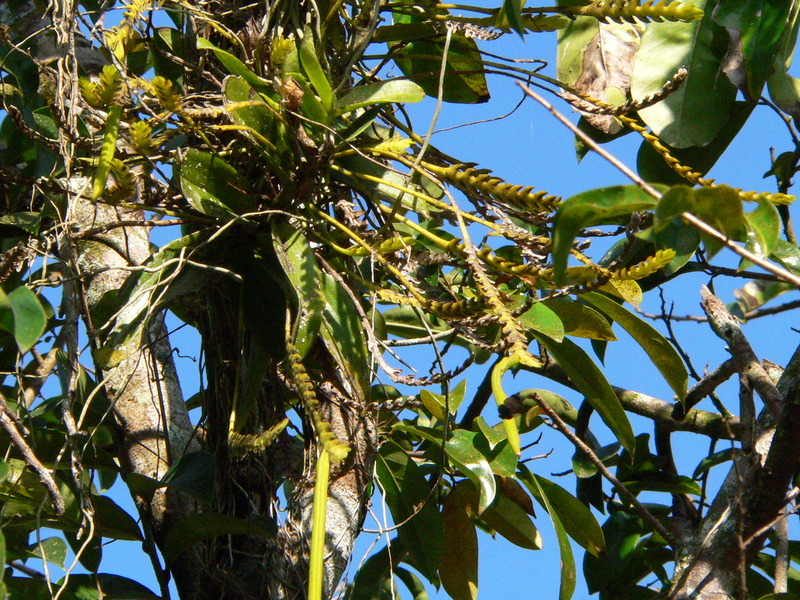 The plants are regarded as widespread and common. They can be found in a variety of forest types and habitats but a good level of moisture and light are usually required for healthy growth. Here at Wild Wings & Swampy Things they have gradually worked their way down from the remnant vegetation on the hillsides. They have persisted in patches of Guinea Grass – Panicum maximum but seem unable to penetrate the several different introduced species of Brachiaria sp. Hence we have a strong desire to rid our property of these dominating exotic grasses and have greatly reduced their presence. 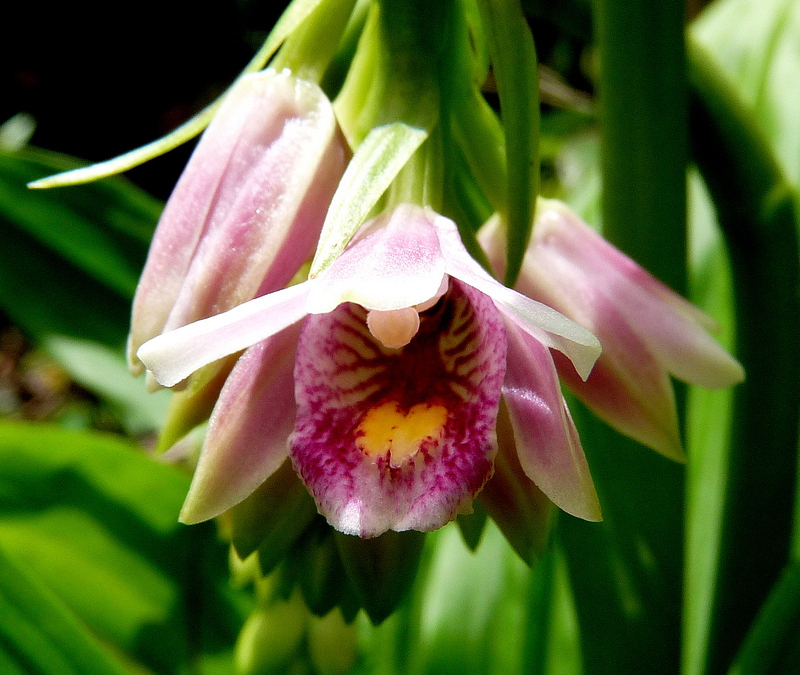 While the outside of the flower is a lovely soft pink, the labellum has a heavily veined deep red upper surface with a splash of bright yellow in the center. 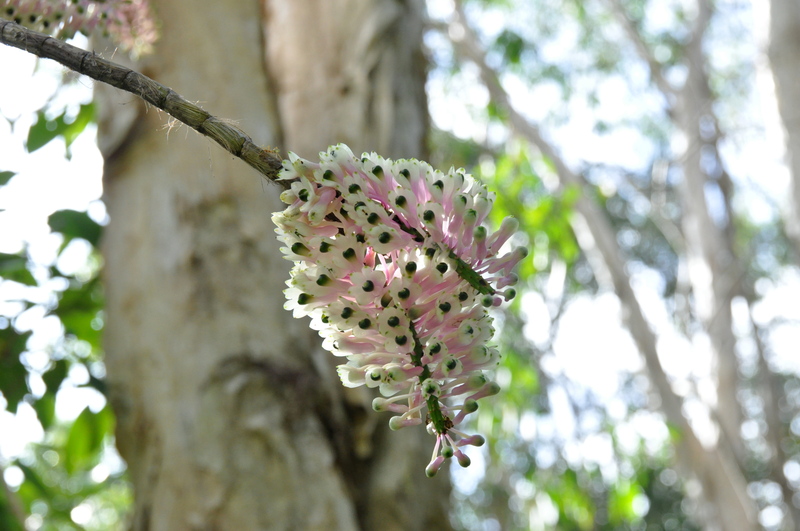 The flowers are pollinated by our small stingless honey bees, although some forms are supposed to self pollinate. I have chosen this last post for 2009 for Denis Wilson who has given me such enjoyment with his regular orchid posts. What a wonderful day was had by all on our day out to Mt Lewis. Barb and I and her brother Richard and wife Susie headed up to Mt Lewis arriving mid morning. We were able to see most of the must see birds that are sought on that moist mountain top. Golden Bowerbird, Toothbilled Bowerbird, Spotted Catbird, Chowchilla, Atherton Srubwren, Yellow Throated Scrubwren, Fern Wren, Grey Headed Robin, Pale Yellow Robin and a host of others. But we also went to see what orchids may be in flower and while there were not quite as many as we would have liked and we were not able to drive right to the end of the road due to road works we did enjoy what we saw. 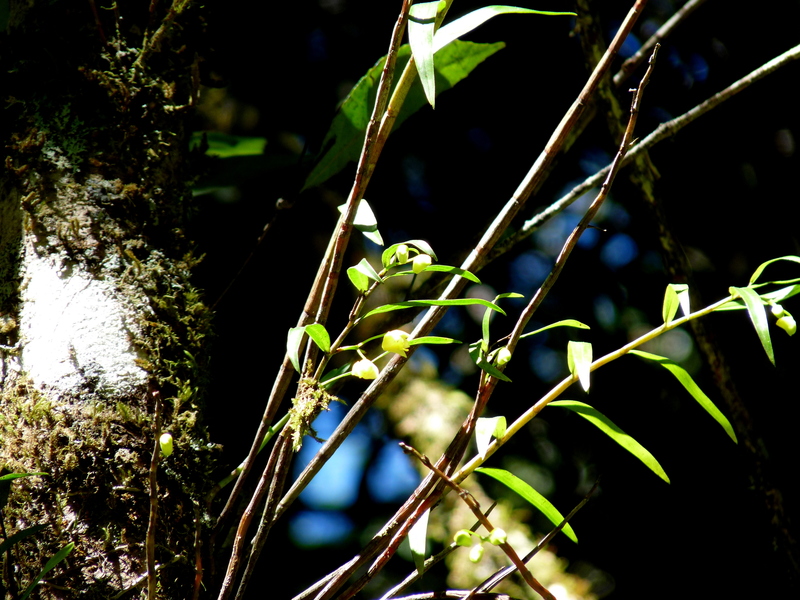 The Slender Cane Orchid (pictured right) was quite common, but usually seen high up in large trees. 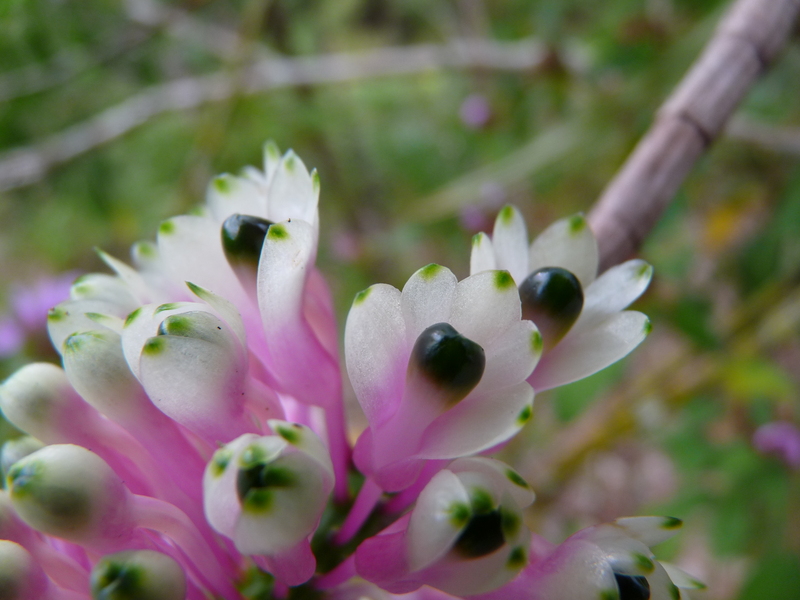 This plant was previously known as Dendrobium adae. 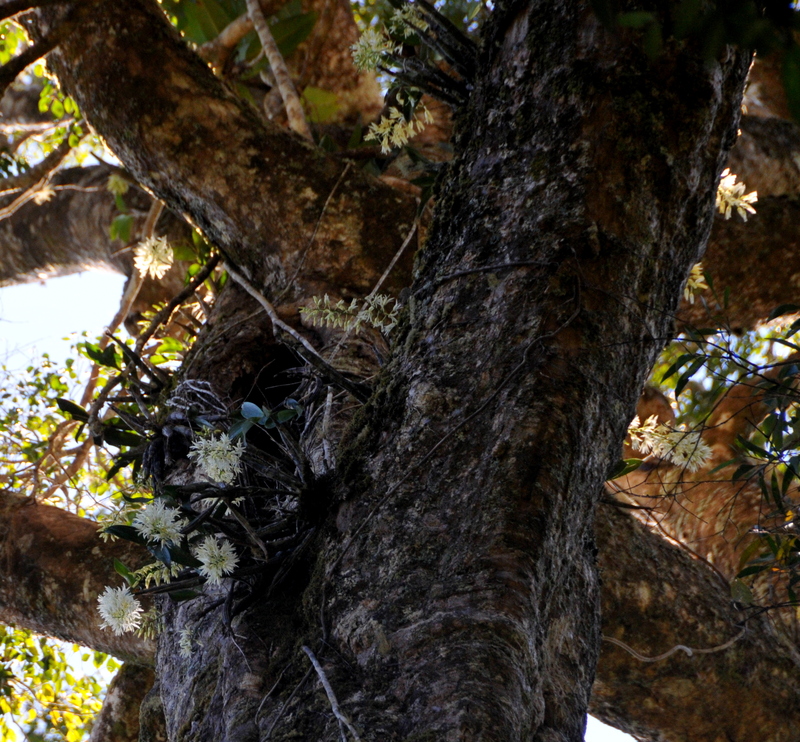 As can be seen in the attached photo the plants were often seen growing in colonies on older trees with a host of other epiphytic plants. The Buttercup Orchids were not as common and were in the early stages of flowering. Once again they were a bit high up in the trees so not so easy to get a good photo of the flower. 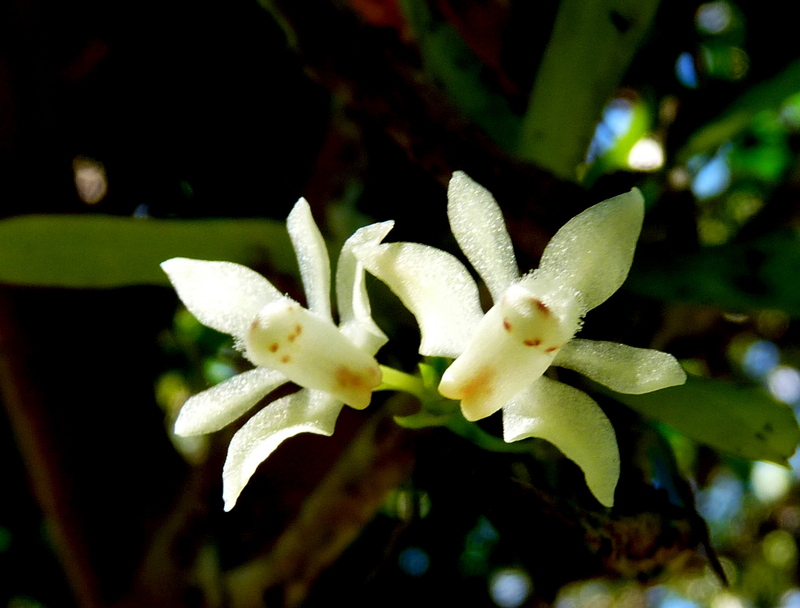 This plant was previously known as Dendrobium a. 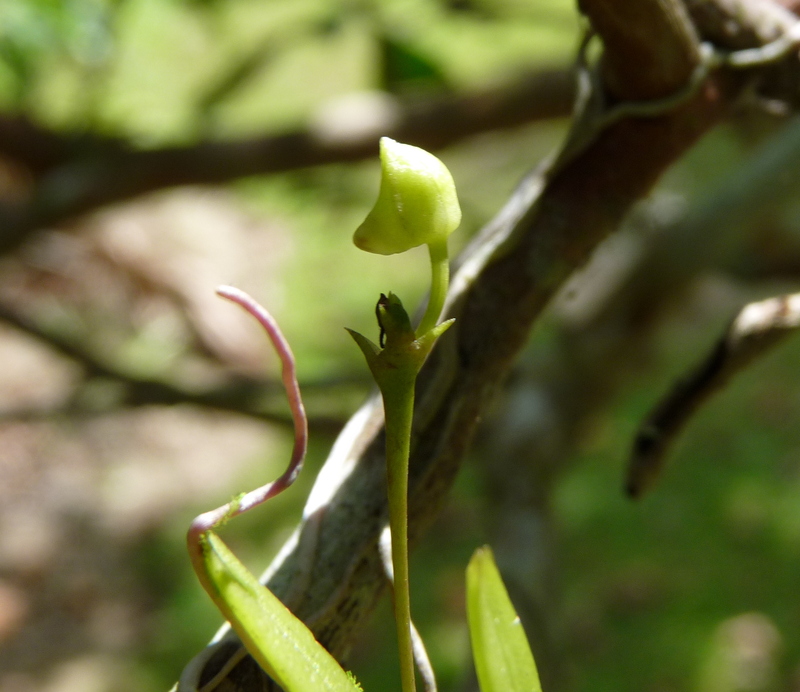 The final post is of a small orchid with a vibrant white flower and a tongue-shaped (hence the species name linguiformis) leaf. Once again growing high on a tree trunk in a well lit and ventilated spot. A very easily overlooked plant as the leaves sit flat against the tree trunk. I only spotted it because I saw the flowers sticking out from the trunk. Sorry that the photos are not crystal clear but we were at full zoom on all of them and white flowers tend to flare a bit. Oberonia (OH-bur-row-nee-a) J.Lindley 1830 titania (ty-TAY-nee-a) Endlicher. This delightful tiny plants Genus was Named after Oberon the King of the Fairies and this particular species was also named after titania the Queen of the fairies. Quite a wit on the part of both Lindley and Endlicher the botanists involved. 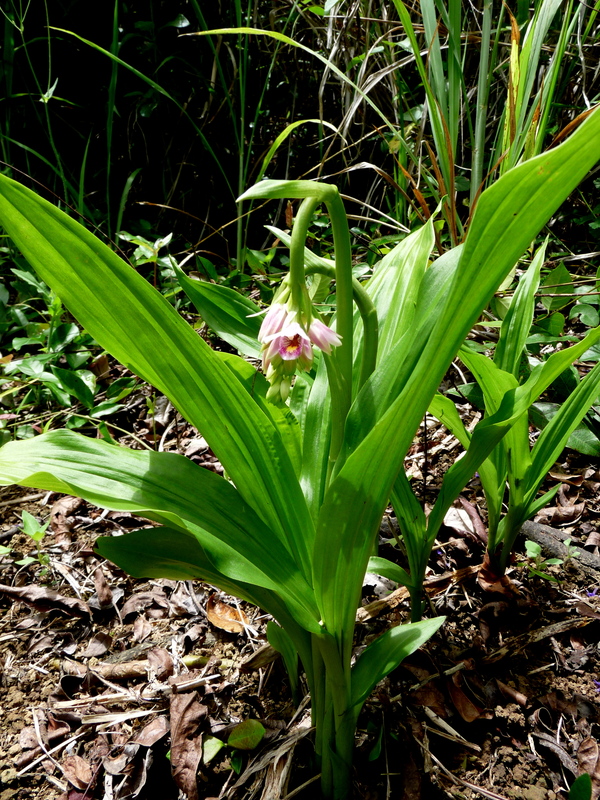 Common name: Soldier’s Crest Orchid. The plant seen at right is about 50mm across with the flower spike being about 80mm long. These dimensions give you an inkling of how tiny and “fairy-like” the individual flowers are at about 1mm across. 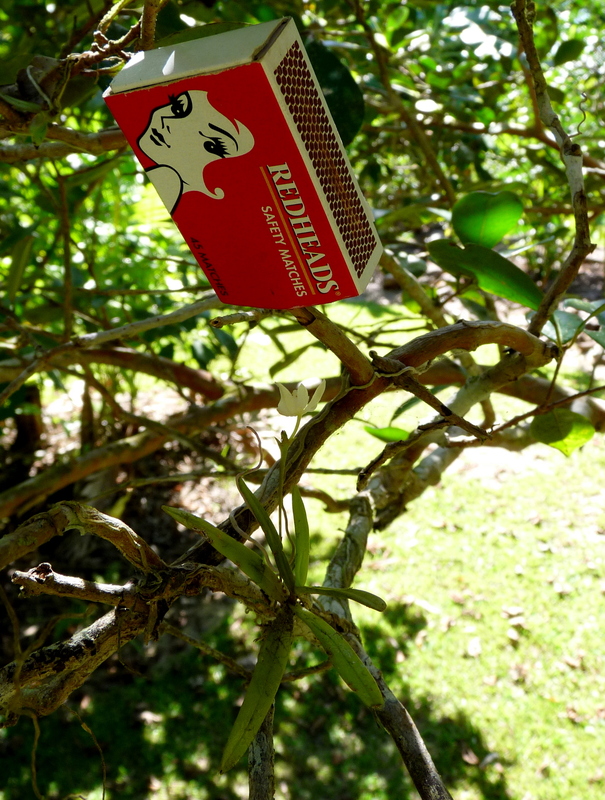 I have found quite a few of these orchids growing on fruit trees in our tropical fruit orchard. They seem to favour Black Sapote (Diospyros digyna). Perhaps because of the fairly rough bark. I have also found them growing in the Mangrove community on similarly rough barked Bruguiera sp. The mature plants seem to have reddish tinge to the leaves, particularly those that are growing in direct sunlight. The orchid family is one that constantly amazes me with its dramatic contrasts. From flowers that are large, flamboyant and colourful to ones that are so small that it is hard to comprehend what minute insect would be visiting the flowers to enable fertilization. If you enlarge the top photo you can clearly see that there are fully formed seed pods on this particular plant so fertilization has been achieved. Dockrillia (doc-RILL-ee-a) calamiformis (calam-ee-for-miss) Jones & Clemesha. Named after A.W. Dockrill, a botanist who specialises in Australian orchids. calamiformis = having a reed-like form. This orchid species is by far the most prevalent epiphytic orchid at Wild Wings and Swampy Things Nature Refuge. It appears to attach itself to any tree that has a rough flaky bark. For much of the year it presents itself as a series of pendulous terete leaves, usually on the underside of a branch or on the trunk of an older tree. 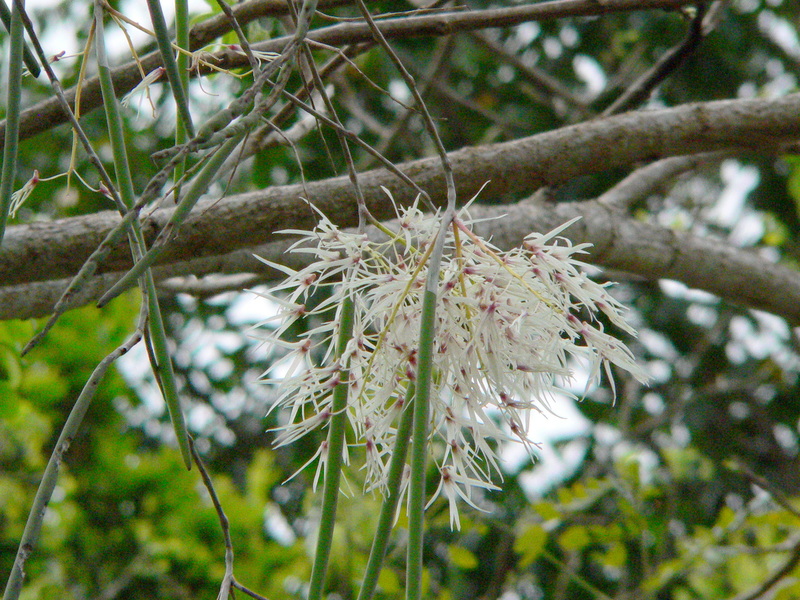 Flowering is often towards the end of the dry season, with the flowers only lasting a few days. A couple of days ago Denis Wilson (The Nature of Robertson) featured a southern cousin of this plant seen at Jervis Bay (Dockrillia teretifolia). Superficially the two plants are very similar. The labellum on the northern plant doesn’t roll back like the southern plant does however. The other striking feature of these attractive orchids is their delicate sweet scent. Thrixspermum (thrix-SPERM-um) J.de Loureiro 1790 platystachys (plat-ee-STACK-iss) (F.M. Bailey) Schlechter 1911. From the Greek thrix – hair; sperma – seed. platystachys = from the Greek platys – flat; stachys – an ear of corn; alluding to the shape of the flower spike of this species. 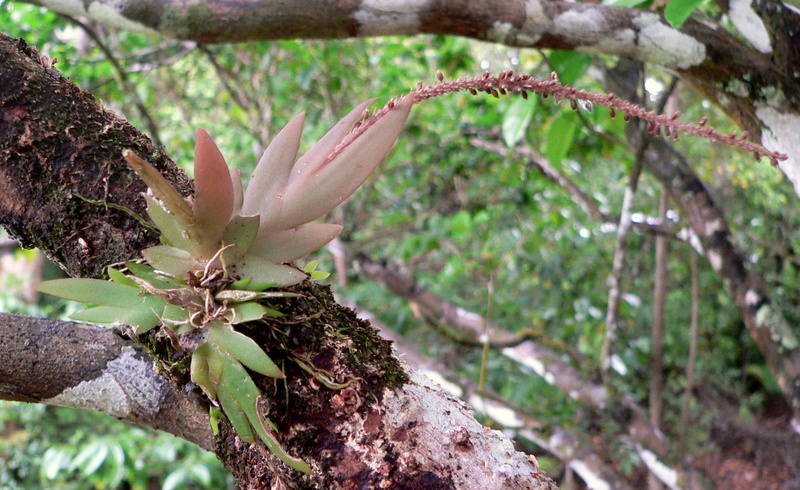 This is an unusual epiphytic orchid of tropical lowland rainforest and mangrove trees. The plants tend to be pendulous with thick glossy-green leaves but has few attached roots. They form, in stead a tangle of roots, leaves and stems that hang from a trunk or branch. They appear to favour well lit situations. Here at Wildwings and Swampy Things Nature Refuge we have several plants that have attached themselves to some of our tropical fruit trees in our orchard. 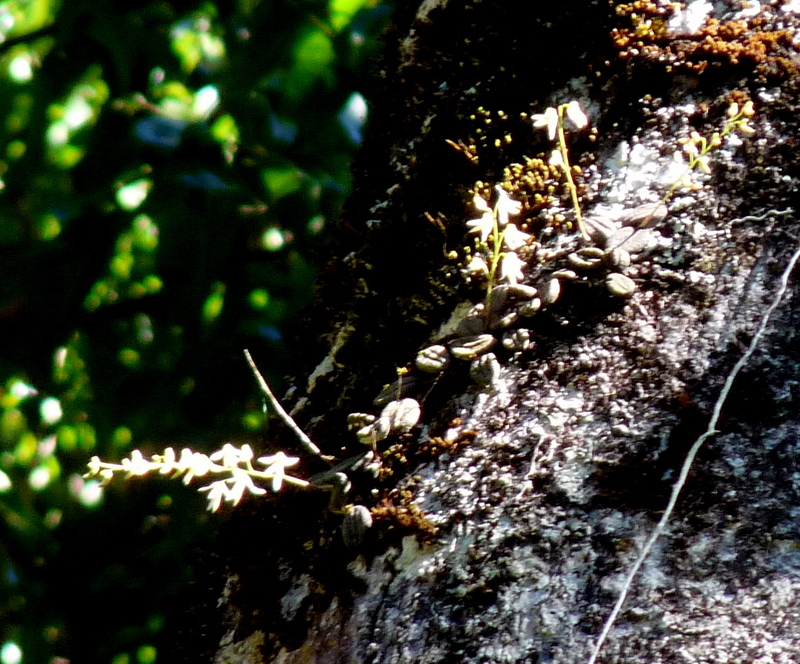 They seem happiest on rough bark ( Rambutan – Nephelium lappaceum) or decayed/ dead branches( Soursop – Annona muricata). 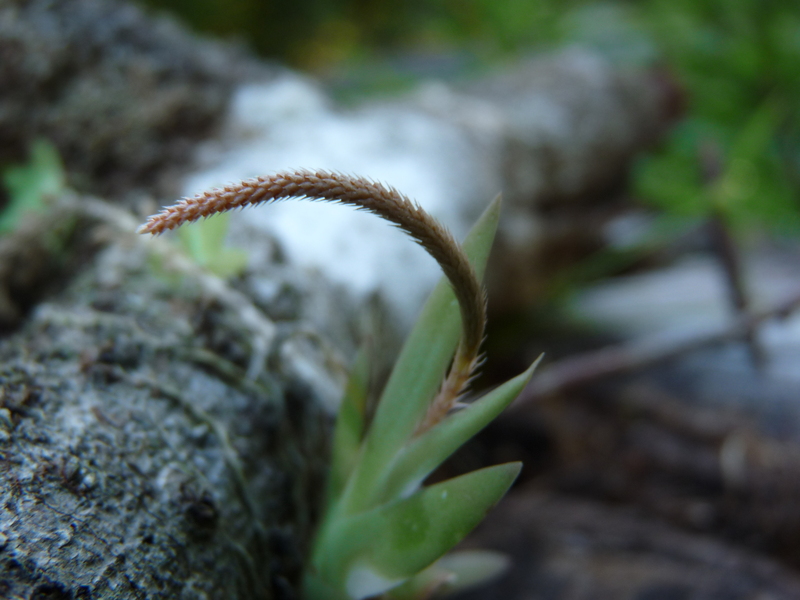 The plants produce odd looking flowering spikes which are persistant on the plant all year. With flowering possible at any time. I have patiently waited for one to flower so that I could photograph the flowers but seemed to miss them, only to find the shrivelled spent flowers on the ground below the plant. That is until this week when I spotted one flowering while I was mowing. The flowers you see only last one day so you have to be constantly checking them. Ironically when I had grabbed the camera to get a photo I discovered that two separate plants on different trees were flowering on the same day. Some weather event may well have encouraged them to action? Unfortunately we have been having drizzly rain so the flowers were not at their best. 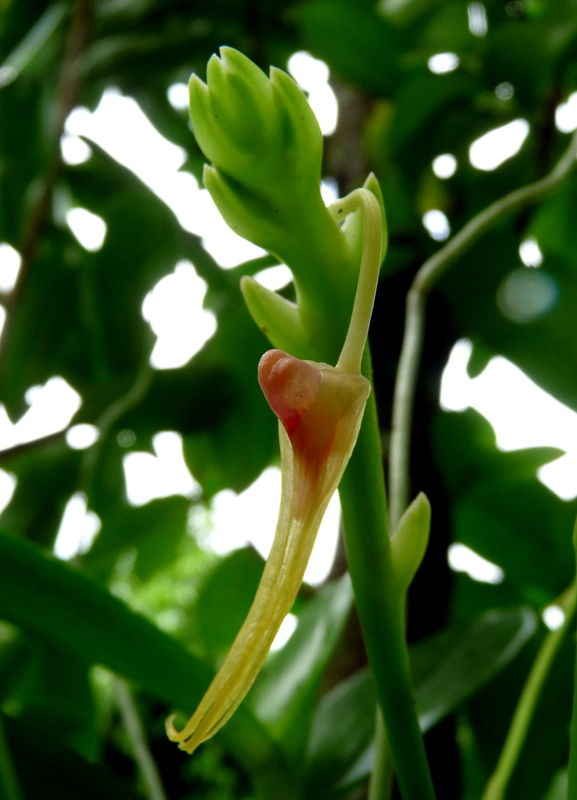 Thrixspermum platystachys - Flower spike. I guess I will have to continue to watch and wait in the hope that I can get a better flower. 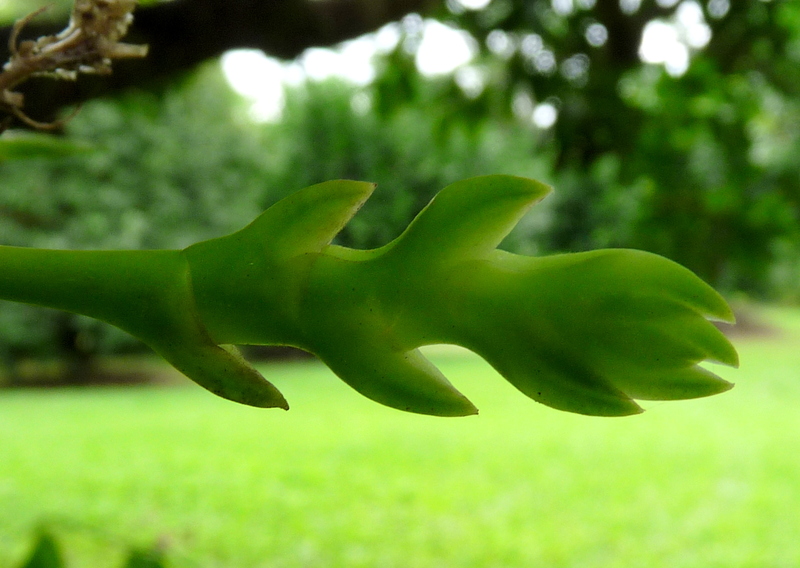 The fruiting body is also somewhat unusual in that they form a long bean-like pod (to 20cm) that protrude from the flower spike. I am yet to see a dry one split and shed its millions of seeds.